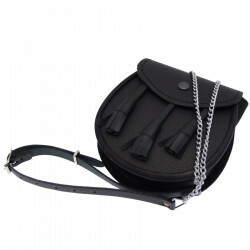 This black leather sporran, studded on the flap, is part of the traditional scottish outfit. Sporran i sa gaelic scottish word meaning purse. It is carried with the kilt, that has no pockets and is attached around the waist. This black leather sporran is the scottish pouch combined with the traditionnal kilt.